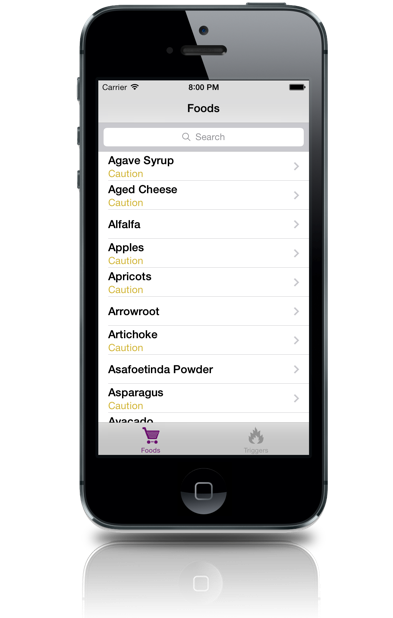 The FODMAPs app makes it simple to discover what FODMAPs are included in foods. 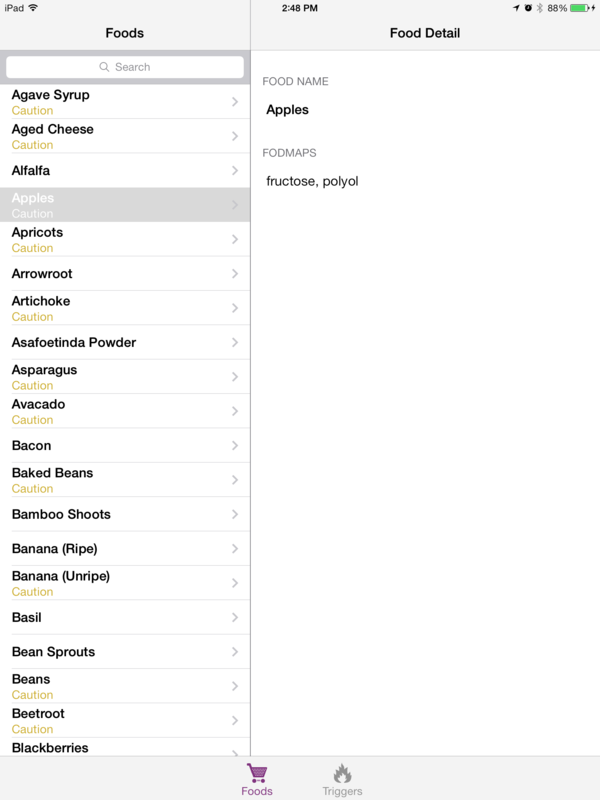 You can search for something you’ve eaten, or plan on eating, and see if there are any nasty FODMAPs hiding in there, or if you know which FODMAPs you are sensitive to, you can easily get a list of foods that you should avoid. 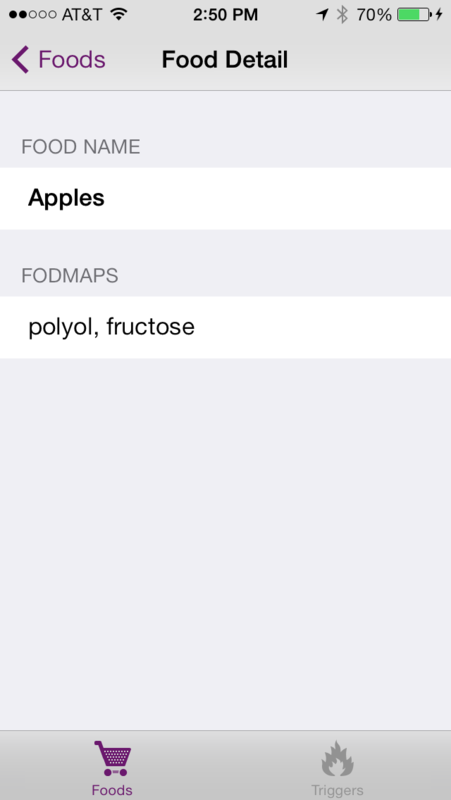 The FODMAPs app was created to help people with irritable bowl syndrome (IBS) and other functional gut disorders who have found that their digestive systems function better when certain FODMAPs are avoided. FODMAPs are "Fermentable, Oligo-, Di-, Mono-saccharides and Polyols" which are short chain carbohydrates that, for many, act as triggers to stomach upset. 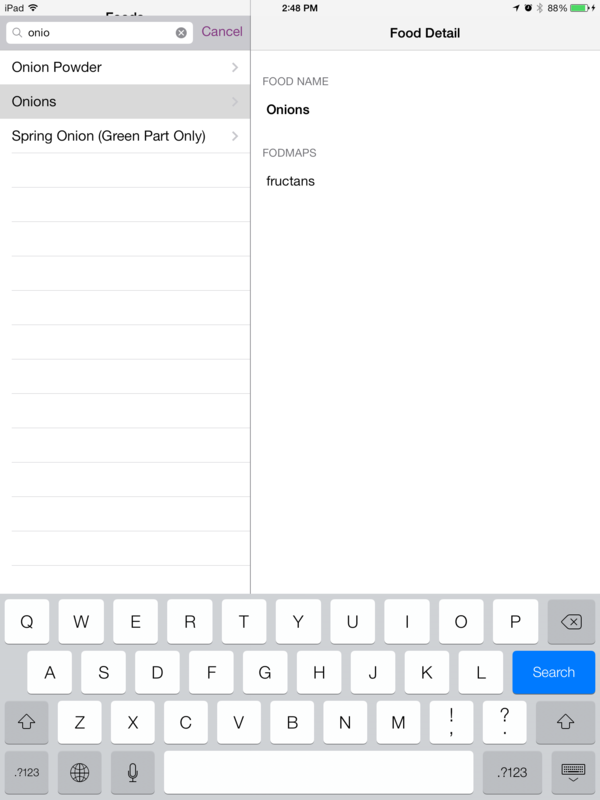 Compatible with iPhone, iPod touch, and iPad (universal). 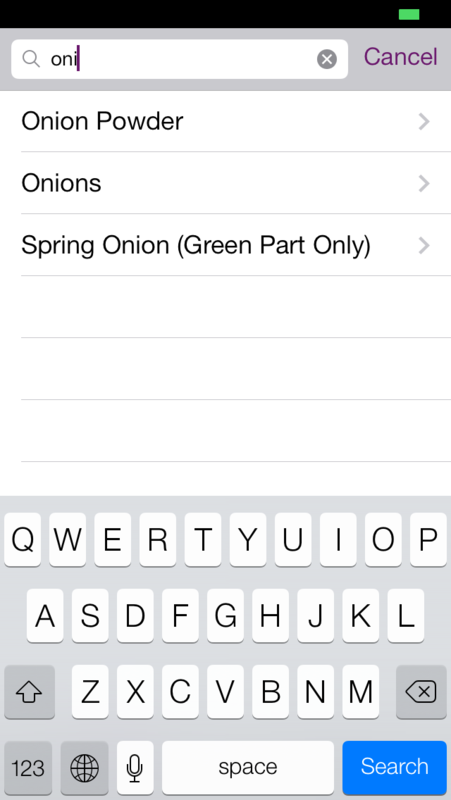 Requires iOS 6.1 or later. Network connection not required. 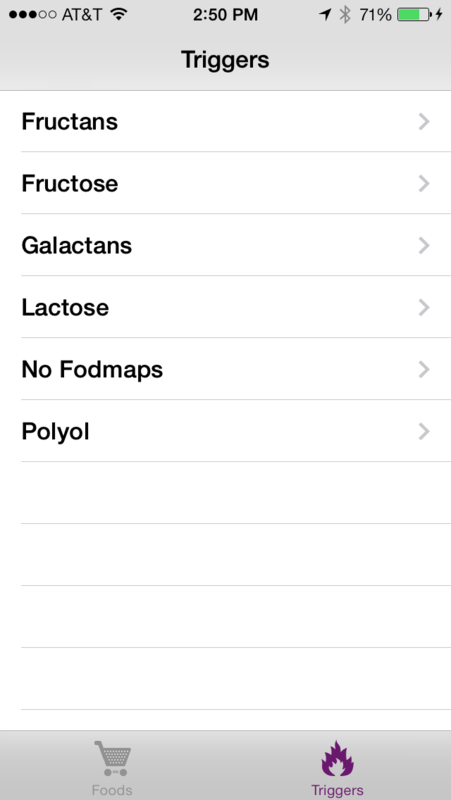 Waking up in the morning with an upset stomach can be a sign that you are sensitive to FODMAPs. Since FODMAPs are something that ferments in your gut, the problem often isn't seen until hours after something was eaten. If you find yourself in this situation often you can use the FODMAPs app to look up the foods that were eaten the night before and see what FODMAPs they contain. Remember those that are present and if you see them again at other times of unset, especially if they are consumed in different foods, then you may have found a FODMAP that you are sensitive too. 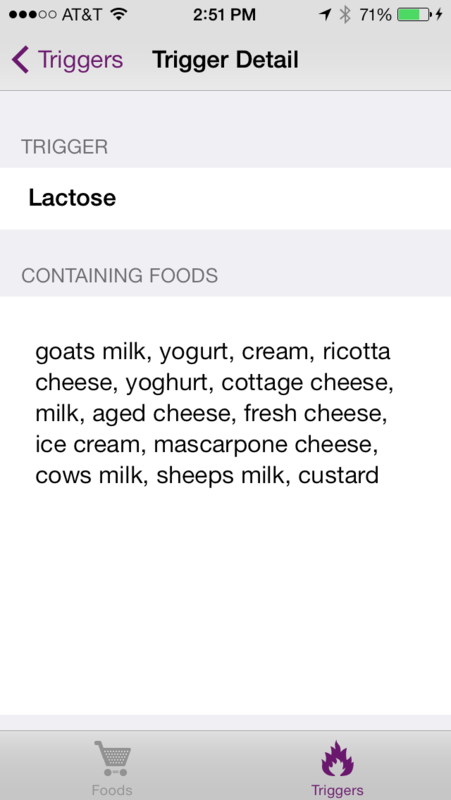 When you think you've found one of your triggers, use the app to find other foods that contain that FODMAP and try avoiding them and see if your morning upset goes away. Great! If you already know that you're FODMAP sensitive and which FODMAPs cause you problems then you're most of the way there! 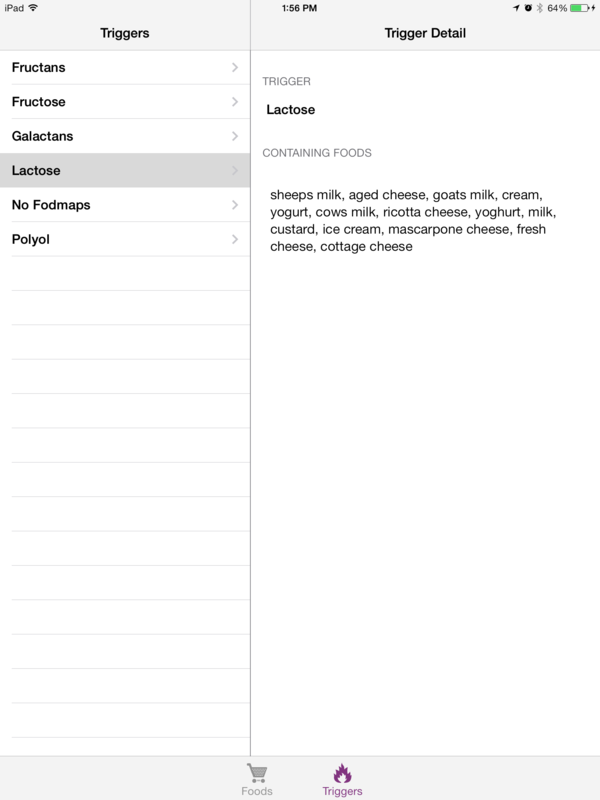 Once you know what FODMAPs cause you upset the trick becomes remembering which foods contain those FODMAPs. 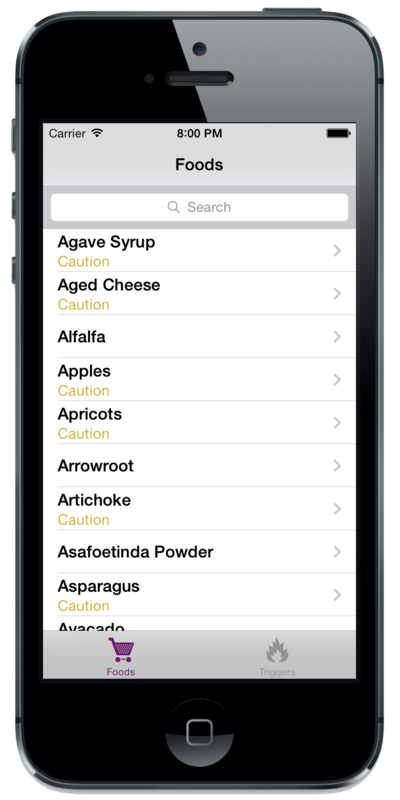 The FODMAPs app can let you search for foods and see if they contain any of the FODMAPs that you're sensitive to, or you can just lookup your trigger FODMAP and the FODMAPs app will show you a list of foods that contain that FODMAP. 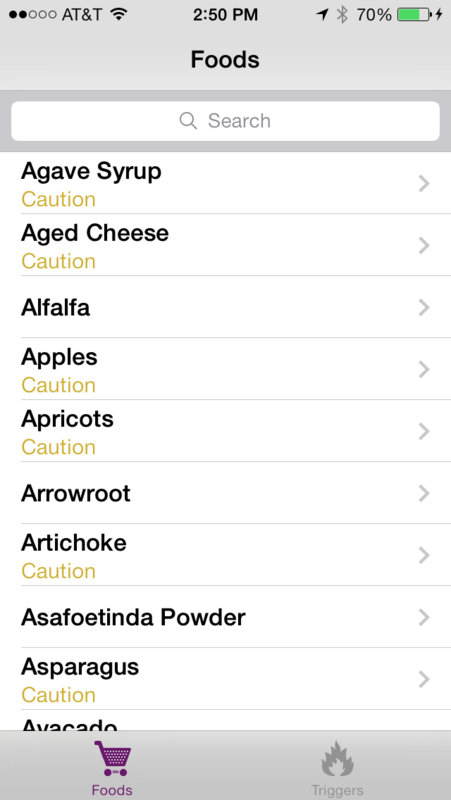 UPDATE Foods that don't contain FODMAPs are no longer referred to as "safe" and a new "No FODMAPs" section has been added to the triggers tab listing foods that don't contain FODMAPs. Big Update Updated for iOS7! Problem! Your email wasn't sent. Are you sure the form was complete? Haza! Your email was sent. Thanks for the contact. Copyright © 2016 Noah Singer.